I love magazines and catalogs. I love the pretty layouts, the fact that I can turn the pages and that they aren’t books and they aren’t a screen. I love both books and screens, but sometimes I need a break from them. This usually results in one of three activities: coloring, exercising, or skimming a magazine. When I finish flipping through one of these lovely periodicals, I want to hold on to every tidbit and pretty picture. As a result, I recently surveyed my office and living room and realized that I had magazines everywhere. It was definitely time to do something. I thought about it for a while and decided I would tear out all of my favorite articles, tips, and pictures. This would allow me to keep my ideas and to dispose of the extra parts of the periodicals that I didn't want. Plus, I knew that I would be more likely to reference these ideas that I loved if they were easily accessible. Not sure what to do with them yet, I embarked on my magazine tearing adventure armed with my iPad and Netflix. I am not going to lie, this process took me about six hours. Netflix. Bliss. The clippings sat stagnant in my file box for a couple of weeks while I was contemplating my next move. Then one day, a dear friend was sick, and I headed to her house with all of my tear outs and the Anne of Green Gables dvd trilogy. (This is a MUST watch if you’ve never seen it.) I sat on her living room floor and categorized all of the pieces of paper. She sneakily snapped a few pics of me. She’s obviously a keeper. A few weeks later, when stalking the discount area at Target, I found these adorable file folders and decided that they would work perfectly for storing my new project! I picked up four packs of six for $1 each. Once I decided on file folders as the way to contain these varying sizes of paper, the rest was easy. Having determined that I wanted easy access to the files and the storage to be pretty and fun, I set out for the Container Store's office sale. I loved the delicate details of the Charleston Collection and the way that I could choose colorful hanging file folders to show through the pattern. So I left armed with the desktop file in white for $15. Next, I knew that I needed to pick out a color for my hanging file folders. I only buy the Smead file hangers. I have purchased other brands and always regret not purchasing Smead because they don't skimp on smoothing out the metal of their hangers. They slide over every type of drawer, box, and container with ease and without those awful metal scraping sounds. Also, they come in every color imaginable. 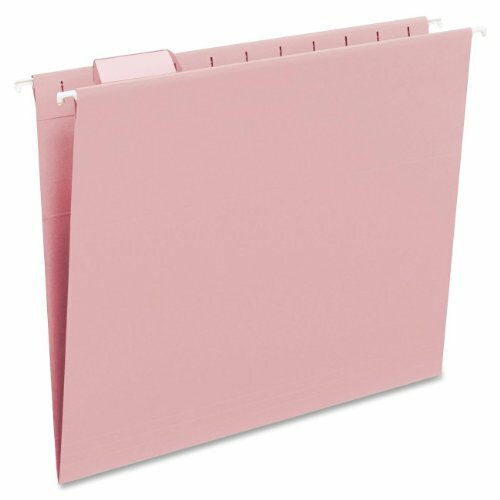 I finally landed on this lovely box of light pink file hangers for less than $9. I added two extra steps, one for my memory and one for appearances. For my brain, I like to take time to jot down the non obvious reasons why I liked the picture or the tip. For the sake of keeping my system pretty, with no bits of paper shards sticking out of my folders, I also like to trim off excess and uneven edges of the pictures. These steps are 100% optional, but they do make everything function just a little bit better. The great thing about having the system down, is that keeping up this process should only take five to ten minutes after I finish reading a magazine or a catalog. I can tear the pictures out as I go, or dog-ear the things that I like and return back to them to tear them out and file them away later. For less than $30, I recovered some mega real estate on my bookshelf and coffee table, gave myself several hours of hands-on tasks, created a new lovely desk piece, and have a place to store non-virtual ideas! I cannot wait to see the different opportunities that I will have to reference all of these ideas now that they are readily retrievable. Are y'all magazine keepers, clippers, or trashers? I'd love to hear about it! Let me know in the comments below. Here is a list of most of the magazines and catalogs pictured: Real Simple February 2016, Real Simple March 2016, Men's Journal April 2016, Crate & Barrel Spring 2016, CB2 Spring Collection 2016, and Dallas Style and Design Spring 2016.